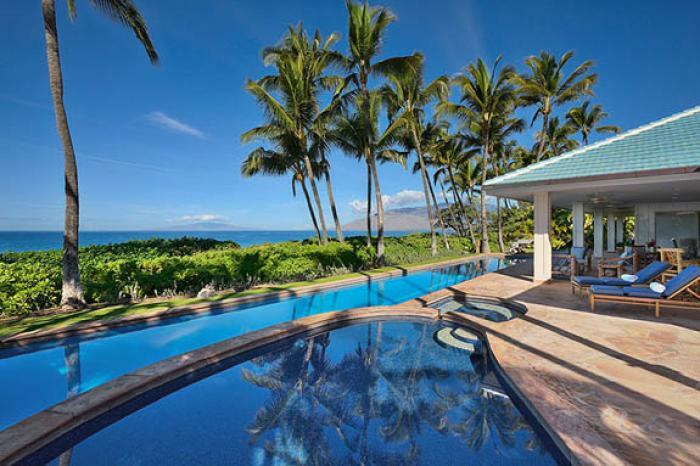 Sitting directly on Kamaole Beach this home fulfills the dreams of the true "beach vacation". This home runs parallel to the ocean, giving most rooms a fabulous view. The pool and hot-tub sit directly in front of the home (between the house and the beach). A row of vegetation provides privacy from other people using the beach. The interior is modern with a huge, central great room. It was designed to reflect the colors that you see when you look outside.... blue for the sky and water, and beiges for the sand. The great room has a large dining table, gourmet kitchen, and large living area. Two bedrooms sit to the left end of the house, and the master suite sits to the right end of the house. This home sits very close to S. Kihei Road, but use of superior quality building materials and landscaping works to minimize any impact. Bedroom #3 - two twin beds (can be made up as king), gardenview, bath accessed from hall.